A quality phone system is a key tool when running a successful business, avoid these common mistakes. Today we are talking to David Colletta, managing director of Prosum. Our topic is ‘The mistakes to avoid when choosing your business telephone system’. A quality phone system is such an important element in running a successful business, as your phone system is one of the key communication tools customers use when making contact with any business. 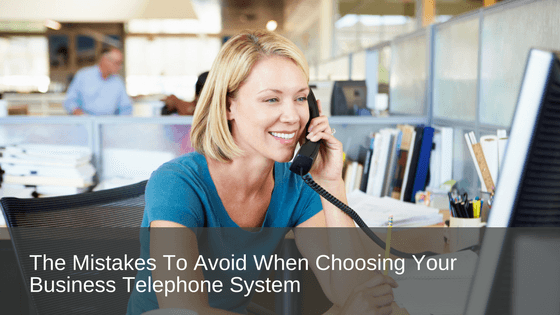 Therefore, when choosing your business telephone system it’s important to know the mistakes to avoid. Traditional telephone systems have been in place for decades. However, how we communicate has evolved over the years, and newer systems are more advanced nowadays and provide businesses with a lot more tools than just talking to their clients. Now, David, choosing a new telephone system is not a decision that should be made easily and, as you know, there are a lot of mistakes that can be made during the process. So, tell us, what are the key factors that businesses need to consider before choosing a phone system? David Colletta: Sure Caroline. The business should consider which deployment model makes sense for them. Now, this could be premise-based solutions, cloud solutions or hybrid and the deployment model often depends on the required functionality and existing infrastructure. When we talk about infrastructure, one of the things to look out for is to make sure that the internal network is ready such as switches, cabling and internet. Business requirements are also important, so do I need telephony only? Video? Collaboration required? And do I need to work from anywhere? These all key factors that all businesses should consider when choosing a phone system. Tell us a little bit more about the varied options with deployment models and the varied business models that they might suit. David Colletta: We found that on-premise systems if we deal with that first. On-premise systems provide a high customization. They might suit customers that typically would have a lot of legacy infrastructure or features that you would not get through cloud type products. Cloud products, on the other hand, gear towards, at this stage we believe, really anywhere up to about 50 users where something that’s pretty much within the box, using either voice or a combination of voice and collaboration. Just depending on the requirements, of either cloud or on-premise, that’s the sort of direction that we would recommend to our customers. Caroline: So, what I’m understanding is then, cloud based systems are quite agile in terms of they’re easily accessible, therefore businesses that are up to 50 users and quite simple to roll out in a business. Is that correct? David Colletta: Absolutely. Everything’s pretty much done for you in terms of the way that the calls are routed internally, to how you answer calls, to how the applications are actually designed on mobile devices. That fits a whole range of customers. The majority, it’s going to be within that 50 user bracket, where we find that that’s been quite strong for us. Having said that, there also are going to be customers, people who fit in that scale. We’re not talking cloud only caters for small organisations; it does scale right up to the hundreds and thousands. The majority of the times we find that, as you do tend to scale up, there are certain requirements, and there are certain features, that customers in the larger enterprise space tend to want, which becomes a bit of a challenge when it comes to cloud products. It really is a case by case basis on how you recommend those products. Caroline: Then, when we talk about on-premise systems and legacy systems, maybe talk us through that from a business owner’s perspective in terms of when they’re choosing a foreign system. David Colletta: The on-premise system, a classic example could be somewhere like a hospital. Hospitals are quite notorious for having old-ish type infrastructure because the building’s been there for quite, many, many years. It’s quite challenging for the IT department to roll out new cabling, either because there are walls that are just too hard to get the cabling down. For that matter, the cost to put in switches, network switches, in some of the areas is also costly as well because of the way you put it together in the actual ward and so forth. What we’ve seen is that an on-premise solution may actually still continue to be valid. There’s always going to be a computer room in a hospital as such and find that replacing what is there with a new, VOIP compatible system if they’ve got a legacy system but also have the ability to also have the analogues or the TDM type infrastructure attached to that. Essentially becomes on-premise with a hybrid type solution. Hybrid component, analogue type, digital type, architecture that they’re used to. That we found has worked quite well in sites that are just challenging to get VOIP type applications rolled out to their rooms and to their offices. Why would a business choose one solution over the other? What are the benefits there for a business? David Colletta: In regards to which way to go, and I’m talking, do I go VOIP or do I go traditional type, these days they’re quite on par. We haven’t found as much differences other than the consolidation of infrastructure that is beneficial on the VOIP side. What I mean by that is, in the old days, the actual infrastructure used to be exclusively just for telephony, and you used to run data purely on one set of cables, but with the introduction of VOIP, you’re able to use the same infrastructure. That’s the key benefit in terms of running on VOIP, we’re not having to deal with two lots of separate cables now but essentially where it comes back on the telephony side or the voice application side, it goes the same. So, whether you want to continue having two separate types of cabling, or just have it where it actually goes on the one set of cables, the features, the functionality is going to be the same. We find that, with the right product, you get the same outcomes so that shouldn’t be a problem. So, David, tell me a little bit about, then, in regards to the models, what are the varied benefits for the models that you describe? For instance, cloud or the on-premise system? What are the different benefits to the business related to those systems when they’re choosing something? David Colletta: Fine. Okay, Caroline, from a cloud perspective, it opens up a complete new raft of advantages that you would get from an on-premise solution. Some of the benefits that we can think about, is currently being rolled out because of this, is work from anywhere. We just find that it’s much easier to have a central cloud product that people can connect to from a mobile app, like through an I-Pad app or Android app. Whereas, if we go on-premise, it becomes a little bit more challenging just to get that setup right. Cloud tends to be quite favourable, work from anywhere perspective. Similarly, with on-premise. The scalability is far more superior than what we can achieve with on-premise. We can scale up and down quite easily based on month by month as well. Examples could be a hotel chain where you’ve got an influx of people requiring rooms for one month, and then, in the next month, they might not have as many users or as many rooms occupied. So, the ability to scale up and down, also a reflection of cost savings over the course of that period that they’re with cloud. When you go on-premise, it tends to be quite static. You tend to buy the licences, the infrastructure, and it’s there whether you use it or not. They’re some of the key benefits that come to mind. We’ve also found that, overall, the cost of cloud is a lot simpler because of the way it’s actually designed in the background. On-premise solutions, potentially, may need a little bit of investment from a resource perspective to manage that cost of maybe associated with external consultants can also be quite costly with on-premise solutions. Whereas cloud, you tend to find that it’s all bundled in within the monthly price. Pricing, lastly, it’s really about pricing. It’s quite competitive now. With cloud, you tend to find that it’s quite on par with on-premise over five years. It could even be a little bit more favourable when you think about the call rates built in. They’re the sort of benefit that I point out from a cloud and on-premise solution. What are the biggest mistakes you see many companies and businesses making when they choose their phone system? Firstly, I’d probably say making a rush decision is high on my list. If something’s broken or something’s just happened that’s caused them to say “Right, I’ve just got to replace what I have”. The problem of that is, sure, you’re overcoming the issue just to get something fixed. However, there’s always constant problems that we see, such as poor voice quality that comes out of it. They find that there’s also poor customer experience with a partner or the vendor that they’ve actually signed up to. Paying too much, obviously, is always going to be there because they’ve not had much time to consider what the costs are. And the contracts that they sign up to become quite onerous, and it’s long term, and it’s a challenge getting out of it, etc. So, planning ahead is quite essential. We find that we recommend where you want to be in, at least, six months prior to your contract buying. When you hear about end of life coming up on your telephony solution, your on-premise solution, that’s sort of a trigger time to start thinking about what we should be looking at. Really would overcome some of the rush decision process makings. Another mistake that we find is customers having poor internet quality. As more cloud based products are out there, customers tend to think that the internet connection that they may have or connected to is suitable for running voice, which may not be the case. I guess a little bit more planning towards that is required. If we’re looking at using voice, we should really consider having an uncontended internet service and lots of bandwidth. What that means is that no one else is going to be on your internet, got plenty of scope to run voice over that because, at the end of the day, voice is quite hungry, it doesn’t behave as what you normally would when you’re browsing your internet, etc. Having a good internet connection, of course, minimises voice distortion, drop outs, that you experience. What we find is that there’s a lot of market share with well-known vendors out there that have glossy products, which, at times, customers aren’t aware the work that’s required goes into them. So, sure, they can sign up, gets included with certain software packages, but ultimately, what it does involve is a lot of back-end work so changing a lot of resources, internally. Outages are also a problem with a lot of those bigger customers. Whereas you find with bespoke type applications, those that are actually designed for voice only, tend to be a lot stronger, a lot more reliable. One of the mistakes out of what I’ve just mentioned is quite critical for customers to understand is ‘where is the core expertise in that application’? Is it a combination of software/data/CRM? Or is it a voice only application? You tend to find those that are only voice-only applications are the ones that are most reliable. So, something to look out for. Caroline: I think what you’ve just outlined there is to, and you mentioned it earlier, is dependent on the requirements, business, in terms of what are their requirements? What does that look like? And tailoring something to match that. But it’s good to be aware of the mistakes that can be made when you go into an investigation process, or when you’re looking at the systems that are available to you, as well, because at least, that way, you’ve got knowledge on what to watch out for. David Colletta: Absolutely correct, Caroline. If you would like to know more about how you can improve your business communications call us today for expert advice – call 1800 007 229 or visit www.prosum.com.au we’d love to hear from you.